Research interests: "My interest in the ocean started early - I was SCUBA-certified at the age of 15 - but it was only after becoming an instructor in Zanzibar that my interest in how organisms use light and color throughout the ocean led me to pursue a Ph.D. in marine biology. "There are obviously a myriad of behavioral purposes behind the evolution of such elaborate development and one organism that particularly struck me was the 'Disco Clam,' Ctenoides ales. My research is currently focused on the evolution of the flashing behavior that occurs in these 'Disco Clams.' I am attempting to understand what evolutionary stressors led to the development of this mechanism, what biomechanical basis controls it, and what the intra- or inter-specific behavioral purpose behind it may be. "My day-to-day research involves looking at the ultrastructure of the mantle tissue, as well as researching evolutionary relationships between closely related species and attempting to find correlations to habitat. The clams I study are found throughout the Indo-Pacific region -- everywhere from Indonesia to Palau to Australia." 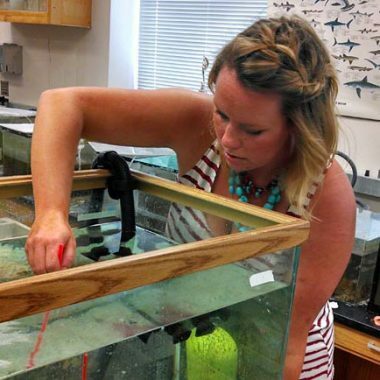 Why UCMP: "I chose to come to work with Dr. Caldwell at UC Berkeley in order to join a lab that is filled with incredibly interesting and unique marine organisms, and the people who are enthusiastic about understanding them. The UCMP will be an invaluable asset to me in helping to understand the fossil record of these bivalves, as well as their evolutionary history."